I don't know about you, but I have a hard time coming up with cute cards for kids. I love bright, fun colors in all parts of my life, but they are the hardest color palette for me to work with creatively. This month for my Just Cards stamp camp, I had a request for a kids birthday card, so I pulled out the Pun Fun stamp set and found a color combination from the Stampin' Up! Idea Book and Catalog. I took it straight from the Hoppy Memories Simply Scrappin' Kit - Real Red, Pumpkin Pie, Tempting Turquoise and Kiwi Kiss. I love how easy the Idea Book makes color co-ordinating. That is truly not my stamping strong point, but all I have to do is just look through the pages of this great resource and there we go. The card base is Pumpkin Pie folded to make a 4 1/2" x 5 1/2" card. The next layer is Whisper White stamped with the balloon from the Sock Monkey stamp set in Tempting Turquoise. I then took a strip of Real Red cardstock cut at 2" x 5 1/4" and punched the left edge with the Scallop Border punch. This is layered with some Kiwi Kiss Striped Grosgrain Ribbon. For my focal point, I started with the top piece of Whisper White cut to match the bird stamp block size at 2" x 2 1/4". That made it easy to measure the Tempting Turquoise layer and the Pumpkin Pie layer at 1/4" larger on both sides for each. The cute little bird is stamped in Basic Black and colored in with co-ordinating markers (didn't I say it was easy!?). I had to add the little cupcake stamp from the Short and Sweet stamp set, the little bird looked hungry! 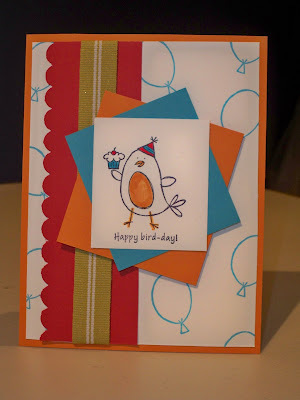 All the layers are angled for a fun feel and then popped up on Stampin' Dimensionals to add depth. I hope you like it and find it easy to CASE. We'll find out next Tuesday if my stamp campers like it! I do still have room in the evening class at 7 pm since I had to reschedule. Class is $15 for 5 projects - all supplies included. Just send me an e-mail to RSVP. Remember, all the products I mentioned here today are available for order on my website 24/7 at www.robinstamps4u.stampinup.net Just click on the Shop Now button in the top right corner and you are there! Too cute!!! I can't image you having problems coming up with anything!!! You are just awesome!! See you on the Big Island!